Harvesting of fruits is easy. Maintenance of the tree is easy. It is easy to remove dead leaves and branches. Why You Should Train and Prune? The question is how to keep a mango tree small? This can be achieved by training and pruning of the tree in a correct manner. You should trim the mango tree so that it grows into a compact shape. Correct training and pruning is very important to make the tree bushy and compact, and most important to get more flowers and fruits. The purpose of pruning a mango tree is to stimulate the formation of new shoots, which widens the width of the tree. Training is done to direct the growth of the tree into a desired shape and form. To maintain a modest height and width, manageable shape. To encourage branching in young tree. Increases nitrogen per growing point and stimulates growth near the cut. To make the plant more productive. To prevent diseases and attack of insect pests. To increase longevity of the tree. To remove the non-productive branches so as to divert the plant energy into those parts of the tree that are capable of bearing fruits. To allow more sunlight and air to the center of the tree. Training, shoot tipping and pruning a mango tree encourage branching and stimulate flushing in young-bearing trees to increase flower and fruit production. Research has shown that the trees with their branches bent to the horizontal direction increases in lateral growth and a significant increase in flowering and trunk diameter. The increased trunk diameter can result in greater fruiting potential of the young trees . When To Prune Mango Trees? The most important point is to know that the pruning in mango is dependent on the season in which it is pruned. So the question is when should you prune your mango tree. While pruning a mango tree, keep in mind that mango trees flower from the tips of the mature wood branches. Therefore, the best time to prune an old mango tree is immediately after harvest. Training and Pruning A Mango Seedling? Training young mango trees is essential for proper tree development. The training builds the tree structure, including its height, width and canopy shape. The pruning involves proper removal of some tree parts such as shoots, spurs, leaves and nipping away of terminal parts etc. to correct or maintain tree structure and increase its usefulness . The picture on the left shows the growth of three new branches on the first prune on a mango seedling. The most critical step to train a mango tree for making it compact is the first cut when the mango is very young, 1 year old; that is still a seedling. When the tree is 6 to 12 inch high, cut plant in the middle. This heading flush growth of trees will increase the number of new shoots, growth rate and tree sturdiness . This pruning will guide the tree's energy on structure buildup and new leaf growth. This severe pruning will restrict the trunk to a lower height, where the primary 2 to 4 limbs will emerge to make the canopy of the tree. It will keep the canopy of the mature tree to a convenient height. The initial training provides good architecture of the plant which is good for fruit production . The height of the first cut is crucial as it will decide the canopy of the mature tree. If the first cut is too high, then the mature tree will be very tall. The first cut will develop 2 to 4 side limbs to create the framework of the tree. Continue pruning for next 3 years when each branch grows to about 8 inch long or when two sets of leaves grow. Always prune just above a node, from where new branches will emerge. The pruning in young tree will not affect the fruit production because the tree does not begin to flower and fruit before two to five years old. 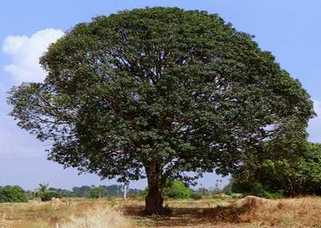 The tree shown above is an old mango tree which was not properly trimmed and pruned. This tree has long upright straight branches and did not developed a good canopy. Most of the mango cultivars have symmetrical branching and grow erect, forming a dome shape canopy and need only occasional pruning . There is no need to prune a mango tree every year, however, pruning old mango trees is important if the tree is very dense and not producing fruits. Severe pruning is needed only in high density tree. It is pointed out that the mango tree flowers from the tips of 6 week old mature wood branches. Avoid tipping when the tree is near flowering time during spring. For the old matured mango trees, you should prune branches by cutting the last shoot including fruit spikes on the node after harvesting when the tree goes dormant. There will be a vigorous growth and branching in the spring where the tree will bear fruits. Remove the dead branches and leaves. Remove the vertical branches which are going straight up. Spreading branches produce more flowers and fruits, sooner than those branches growing vertically. If the tree has grown too much, you can prune up to 25% of the tree to reduce its canopy including its height and width. Remove branches which are producing few or no fruits to admit more sunlight. It is pointed that severe pruning of the tree will reduce fruit production for many fruiting cycles. So prune one or two branches at a time in a year. Training and Pruning a Mango Orchard to Improve Blooming and Yield in South Florida (PDF), Proc. Fla. State Hort. Soc. 129: 2016.